I have to admit, I wasn’t very excited about this recipe. I haven’t really been that excited about cooking in general, but it could just be laziness. I’m a little late in posting this, but here’s the strudel recipe. I think the strudel turned out great, although my crust turned out more like a pie crust than a pastry crust. Either way, it won’t last long. It was a big hit around here! 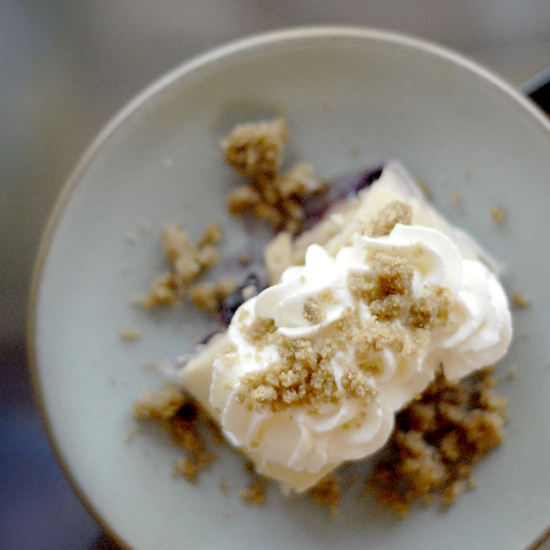 I topped it with creme fraiche and streusel and included blueberries in the filling. YUM. Head over to Make Life Sweeter for the full recipe. Your strudel looks a lot better than other ones that I’ve seen other DB’s complete. What did you sprinkle over the top? Oh, that looks yum. I love that side view, so many layers! Oh I want to eat that sooooo badly!!! You make everything look beautiful!